This patient presented at the clinic, unhappy with her current smile and wanting to correct some previous dental problems. 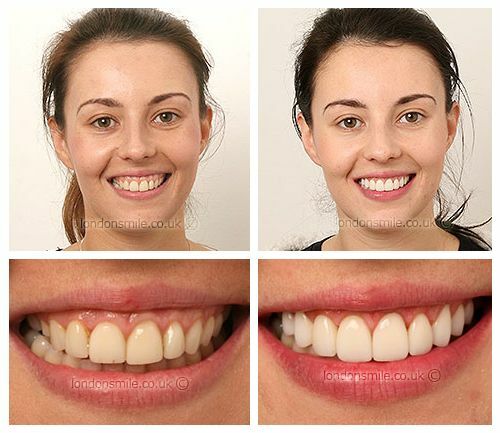 Fixed braces were worn for 8 months, once aligned the patient had a gum lift and replacement veneers on the front 8 teeth. I love to smile and wanted lovely teeth I could be proud to show off. They are also a huge part of my career. It was also to correct previous dental problems. I have had laser gum surgery, gum lift, replacement of veneers on my top teeth. Also corrected my bite and jaw. I felt very nervous beforehand, but was made to feel extremely comfortable and happy throughout the whole treatment. I could not be happier, it exceeded expectations! I love them and show them off as much as possible. I already have. So many people have complimented my teeth and I always redirect them to your website. It has boosted my confidence more than I could ever have imagined. It will certainly show when I walk into an audition. They became my friends, always so friendly and make me and my parents feel so welcome and comfortable, I couldn’t thank them enough!